Last week was Little I’s sports day. Her preschool joined forces with the infants for a lovely morning event, and believe it or not, the sun came out! Little I was incredibly excited for it, and had been training in the garden (of her own accord!) for weeks. She even had The Mobot rehearsed for crossing the finishing line. 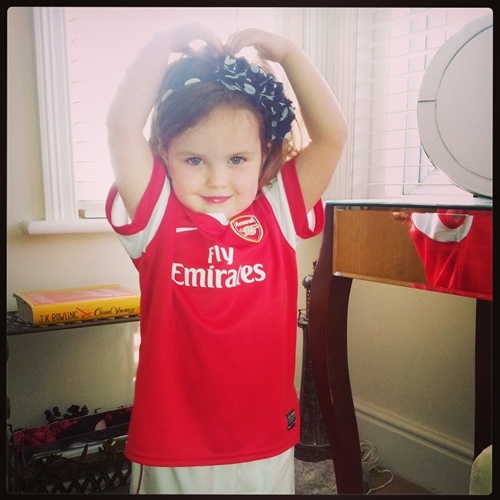 On the day she decided she wanted to wear her full Arsenal kit and a pair of hand-me-down Nike trainers which were at least a size too big. Who were we to interfere?! When it comes to running, Little I really isn’t built for speed. Her little legs set her at quite a disadvantage, which I think she’s aware of, but nevertheless she was undeterred. In the run-up she had mentioned to us a few times that we shouldn’t expect her to win, but we were keen to reassure her that we only wanted her to try her best. The children were divided into small groups, by ability, but from the line-up Little I was easily the smallest in her group. There may or may not have been a false start, and Little I was blocked by the teacher starting the race…but setting excuses aside, she came well and truly last! Moments like this make you realise how it’s not all about winning though, when it comes to being a parent. Just her taking part made me swell with pride (as not every child was brave enough). Bless her, she put everything she had into the race, and she kept going until the finishing line, in full knowledge that she was always going to come last. She still had a smile on her face afterwards and gave us a ‘thumbs up’, proving that she’d still had fun. We had no concerns that she’d be upset about losing, which for a four-year-old made us pretty proud, as some of her peers are struggling with that right now. She took it all in her stride, and is already in training for next year! On the way home from preschool that day she told us “a good girl never gives up”. It took me a few days to realise where she’d got this from. She’d adapted the saying of Peter Rabbit, “a good rabbit never gives up”. What a lovely lesson for her to take to heart. It’s a lesson that will take her far in life, if she chooses to remember it. Well done Little I for putting in such great effort, and for making us so proud!